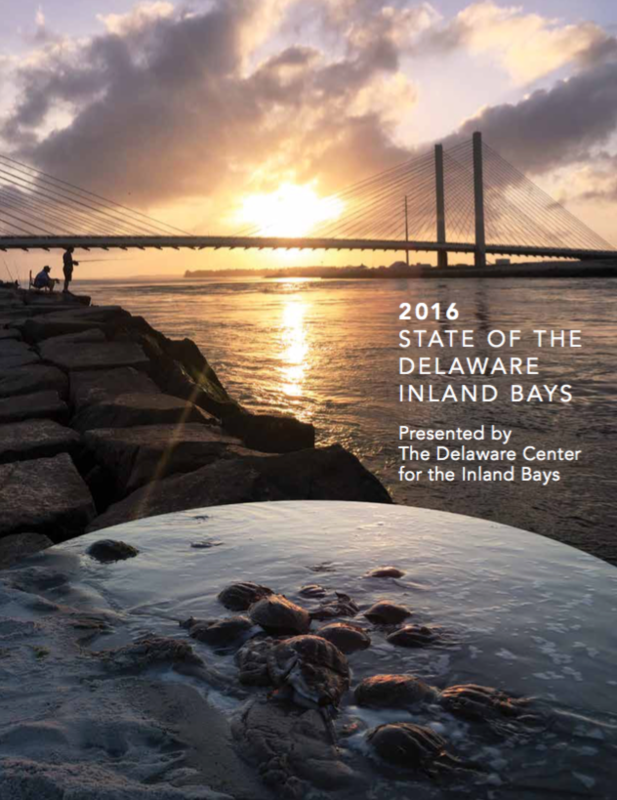 The 2016 State of the Delaware Inland Bays report is a compilation of environmental data about the Bays that is updated every five years. The content is grouped by subject matter into 35 bite-size indicators that can provide communities, decision makers, and concerned citizens with robust scientific information to help restore and protect the Inland Bays and the surrounding watershed. The population in the watershed more than doubled between 1990 and 2010 when the last census was conducted. Population growth is driving many of the changes that are impacting the Inland Bays. After a slowdown brought about by the recession that began in 2008, intense development is underway again, much of it near waterways where water quality impacts can be the greatest. With development comes impervious surfaces. Parking lots, roadways and roofs now cover over 10% of the watershed’s land area—a point at which studies show detrimental impacts to water quality in estuaries. Nutrient pollution from nitrogen and phosphorus remains the greatest threat to water quality in the Bays, but actions taken to reduce nutrient inputs give reason for optimism. The volume of tidal water passing through the inlet has increased over time. This helps flush out nutrients, but has also contributed to degradation of marshes in the Bays. Overall, water quality in the Inland Bays remains fair to poor, though Little Assawoman Bay and open waters near the inlet are showing some improvements. More than 6,800 homes on septic systems were connected to central sewer since 2011, and discharges from point sources are down more than 80% since the 1990s with only two ‘point sources’ of pollution to the Bays remaining out of thirteen. Voluntary actions to reduce nutrient pollution, prescribed by the Pollution Control Strategy for agriculture and stormwater, show little progress, highlighting the need for dedicated funding. Human health risks continue for those using the Bays for recreation. Most tributaries and canals continue to have very poor water quality and are unsafe for swimming or for the harvest of shell fish. As the watershed urbanizes, loss of wetlands and natural shorelines impact both migrating and resident animal populations. Blue Crab populations remain low, and recreational fishing and its local economic benefits have not yet rebounded from losses brought about by the recession. Bald Eagles and Ospreys are thriving in the Inland Bays, and hard clam populations have been stable since the 1970s. Bay grasses, a signature species of healthy coastal bays, are still largely absent from the Inland Bays due to nutrient pollution. Global emissions of carbon dioxide are bringing higher air temperatures, a longer growing season, and warmer Bays. 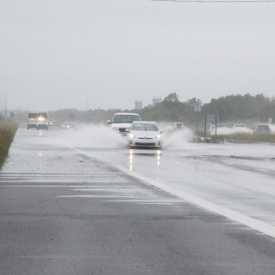 Sea level in Delaware is now rising at a rate of 1.1 feet per century and is projected to increase to nearly five feet by 2100. The population of the Inland Bays watershed is growing, and the landscape is rapidly changing from farms and forests to residential and commercial development. Much of the development is concentrated around waterways where its potential impact on water quality is greatest. Since the last report, development increased another 7.8 square miles (11%), replacing agricultural lands, upland forests, and wetlands. With development comes more roads, parking lots and rooftops that generate polluted runoff to the Bays. The watershed as a whole has now exceeded 10% coverage by these impervious surfaces—a tipping point at which water quality has been found to degrade in estuaries. Balancing this is a reduction in the application of fertilizers that occurs when cropland is converted to other land uses. Activities to protect natural habitats in the watershed have nearly stalled since the previous report was published. Salt marshes are disappearing at higher rates. Funding and incentives for conservation, enhancement of forested buffers, and wetlands protection are needed. The estimated volume of water moving in and out of the Bays through the Indian River Inlet increased by at least 11% since 1988, likely contributing to observed improvements in water quality in open Bay waters. What these changes mean long-term for the watershed is uncertain. What is certain as population growth and urbanization continues is that the most effective technology for controlling storm water runoff and treating wastewater will be needed to protect the Bays. Nutrient pollution is the largest problem facing the Inland Bays. 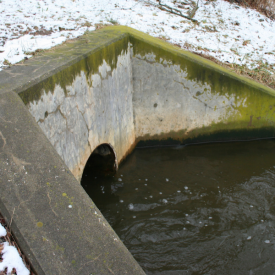 Point source pollution originates from a pipe, such as discharge from a wastewater treatment plant. Nonpoint source pollution originates from diffuse sources and enters the Bays through groundwater and surface runoff. Sources include fertilizers, septic systems, land application of wastewater, and stormwater runoff. Atmospheric sources originate from the emissions of power plants, automobiles, and agriculture that later deposit directly onto the surface of the Bays. The maximum amount of nutrient pollution that a water body can receive and still support healthy environmental conditions is called its Total Maximum Daily Load (TMDL). In 1998, state regulations established target loads for the Inland Bays. The regulations require elimination of all point sources, a 40 to 85% reduction of nonpoint source loads, and a 20% reduction of loads from atmospheric deposition. In 2008, the Delaware Department of Natural Resources and Environmental Control enacted a Pollution Control Strategy (PCS) that laid out a series of regulatory and voluntary actions needed to meet the TMDL. After decreasing by over 80% since the 1990s, point source pollution decreased only slightly since the last report, and two point sources remain in the Bays. Nonpoint source nitrogen loads remained far in excess of healthy limits in all bays, but loads to Little Assawoman Bay may now be decreasing. Phosphorus loads on average were within healthy limits for Rehoboth and Little Assawoman Bays, but continue to exceed healthy limits for Indian River Bay. Atmospheric nitrogen loads are now within healthy limits. Substantial progress was made on conversions of septic systems to central sewer, far surpassing the pollution reduction goal. Voluntary agricultural and stormwater nutrient management practices yielded very little progress, highlighting the need for dedicated funding for these most important bay restoration actions. Measures of water quality are the most basic indicators of Bay health. They are key measures of the effectiveness of actions taken to reduce pollution to the Bays. The six water quality indicators are based on the minimum requirements necessary for reestablishment of bay grasses and healthy dissolved oxygen levels. Each water quality indicator individually is useful to assess changes in the health of the Bays, and collectively they provide a clearer picture of ecological conditions. The water quality information used in this report comes from more than 30 long-term monitoring sites located in tidal portions of the Bays. Data are collected by both the Department of Natural Resources and Environmental Control and the University of Delaware’s Citizen Monitoring Program. Overall, water quality in the Inland Bays remains fair to poor, but is improving. Compared to five years ago, nutrient and algae concentrations have improved in some areas. 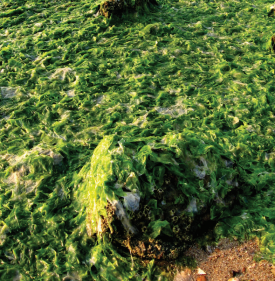 Many places have seen modest long-term positive trends in phosphorus and algae levels. Water clarity and dissolved oxygen in the Bays, however, have seen no significant long-term improvements. Although seaweed abundance is down compared to the 1990s, blooms still occur. Few areas had water quality conditions that are thought to allow bay grasses to reestablish. Most tributaries and canals continue to have poor water quality. Water quality improvements are, however, being seen near the Indian River Inlet and in Little Assawoman Bay. With its smaller ratio of land to water, and high water tables, Little Assawoman is likely to be the first Bay to respond to improved watershed management. Until nutrient inputs to the Bays decrease, water quality is likely to remain impaired, particularly in tributaries. Increased tidal flushing through the inlet has likely contributed to better water quality in parts of Indian River and Rehoboth Bays. Abundance—or absence—of birds, fish, and shellfish in the Bays are often the most noticeable signs of environmental changes. These living resources are useful indicators of shifts in water quality, habitat, and climate; in part because they are easy for us to observe. Since the 2011 State of the Inland Bays Report was issued, living resource indicators continue to present a mixed picture. On the positive side, Bald Eagles and Ospreys rebounded from pesticide pollution, and the number of osprey nests continues to increase. After declines in the 1980s, the number of Black Ducks that winter here has stabilized. Hard Clam populations have been stable since 1976 and continue to support a fishery. On the downside, numbers of wintering Brant and Canvasback in the Bays are declining. 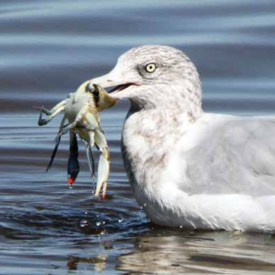 The Blue Crab population has not rebounded. Bay Anchovy populations have also declined over the years. Bay grasses remain rare in the Inland Bays, while coastal bays in Maryland and New Jersey have thousands of acres of these highly valuable habitats. Recreational fishing and its local economic benefits have decreased, likely due to the recent recession. Once-through cooling water withdrawal at the NRG Power Plant came to an end in 2013, along with the resulting fish and crab losses. This is expected to improve the fishery of the Indian River. Reduced nutrient inputs to the Bays should lead to future water quality improvements and, it is hoped, create conditions that allow bay grasses to re-establish. Water recreation and eating fresh seafood are some of the great joys of living on the coast; however, there is reason for caution when using many areas of the Inland Bays. Pathogens—illness causing bacteria, viruses, and parasites—can enter water from many sources, including waste from wildlife, humans, and domestic animals. Some bacteria that occur naturally in the Bays also can be pathogenic. Exposure to these pathogens through water contact may cause acute gastrointestinal illness or infect open wounds. 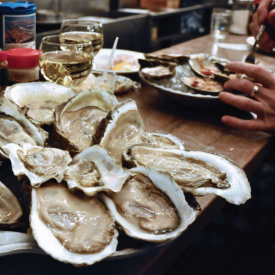 People may also be exposed to pathogens by eating contaminated shellfish. The open waters of the Inland Bays are generally safe for recreational contact such as swimming. However more poorly flushed tributaries and canals regularly fail to meet safe swimming standards. Currently 61% of the Inland Bays are approved for shellfishing year- round— down 1% since the previous report. An additional 3.6% of Bay waters were moved from seasonally-approved to prohibited status. Chemical contaminants from a variety of industrial, urban, and agricultural sources can also enter surface waters, where they accumulate in fish. Mercury and polychlorinated biphenyls (PCB’s) have been identified as ‘contaminants of concern’ present in migratory Bluefish and Striped Bass caught in the Inland Bays, though the chemicals likely are picked up elsewhere. Both species are currently under consumption advisories. Concentrations of PCBs and mercury in fish are expected to decrease slowly but it may be decades before consumption advisories are lifted. Removal of the Rehoboth Beach Wastewater Treatment Plant discharge scheduled for 2018 may allow reopening of some waters closed to shellfishing near the Lewes-Rehoboth Canal. Global emissions of greenhouse gases are bringing about higher temperatures, longer growing seasons, and rising sea levels. 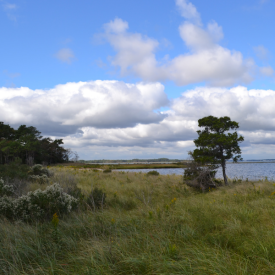 These changes influence everything from the chemistry of bay water to the location and distribution of ecosystems like saltmarshes and bay grass meadows. The timing and degree to which migratory fish and birds use the estuary may change; species of plants and animals may shift in favor of those that prefer or tolerate warmer weather. Increasing heat is a significant concern. The growing season will continue to lengthen, and heat waves are expected to become more extreme. As a result, the Bays will likely be warmer for a longer period each year. While no changes in average annual precipitation have been observed, increasing frequency of droughts and floods may be occurring and are projected. This could increase the transport of nutrients to the Bays, which can lead to conditions that create oxygen-depleting algal blooms. The State of Delaware has taken action to address climate change through the signing of Executive Order 41 in 2013. This order directs state agencies to address both the causes and consequences of climate change by developing actionable recommendations to reduce greenhouse gas emissions that contribute to climate change, increase resilience to climate impacts, and avoid and minimize flood risks due to sea level rise. While full implementation of this directive will result in reduced greenhouse gases, emissions must be reduced worldwide to make an impact.